Murder by Gaslight: A Modern Macbeth Murder Case. 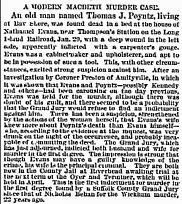 An old man named Thomas J. Poyntz, living at Bay Shore, was found dead in a bed at the house of Nathaniel Evans, near Thompson’s Station on the Long Island Railroad, Jan. 29, with a deep wound in the left side, apparently inflicted with a carpenter’s gouge. Evans was a cabinetmaker and upholsterer, and apt to be in possession of such a tool. This, with other circumstances, excited strong suspicion against him. After an investigation by Coroner Preston of Amityville, in which it was shown that Evans and Poyntz—possibly Kennedy and others—had been carousing on the day previous. Evans was held for the murder, although there was doubt of his guilt, and there seemed to be a probability that the Grand Jury would refuse to find an indictment against him. There has been a suspicion, strengthened by the actions of the woman herself, that Evans’s wife knew more about Poynitz’s death than Evans himself—who, according to the evidence at the inquest, was very drunk on the night of the occurrence, and probably incapable of committing the deed. The Grand Jury, which has just adjourned, indicted both husband and wife for murder in the first degree. The impression is strong that though Evans may have a guilty knowledge of the crime, his wife is the principal criminal. They are both now in the County Jail at Riverhead awaiting trial at the next term of the Oyer and Terminer, which will be held in April. This is the first indictment for murder in the first degree found by a Suffolk County Grand Jury since Nichols Behan for the Wickham murder 22 years ago. "A Modern Macbeth Murder Case." 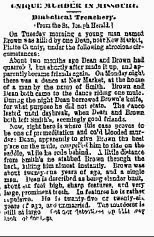 New York Tribune 26 Mar 1877: 8.